The cropping systems that offer the greatest chance of success for realizing fall forage production from a forage double-crop are those following wheat, hybrid seed corn, and corn silage. Planting winter sensitive species (such as oats, spring varieties of other cereal grasses, and brassicas) between Aug. 10 and Sept. 10 in Nebraska can result in 1 to 2 ton DM of high quality forage. Brassicas tend to be a low cost source of forage but can't be grazed in a monoculture (alone) because they are too low in fiber and too high in sulfur (S). Therefore, we recommend planting 40 to 60 pounds of oats and 3 to 4 pounds of turnips per acre. These can be a good option for backgrounding spring-born calves as the quality of oats and brassicas is extremely good. The oats and brassicas will die after several hard freezes and forage will look yellow. However, quality is maintained. When grazing in the winter (November to January), gains of 1.5 to 2.0 pounds per day can be achieved. When stocking at one calf per acre 50 to 70 days of grazing is typical. Although there is some risk of crop failure (low forage yield), the costs are low enough that the successful years will more than make up for years in which failure occurs. Being able to irrigate to get the stand started, if needed, will substantially reduce the risk of a crop failure. 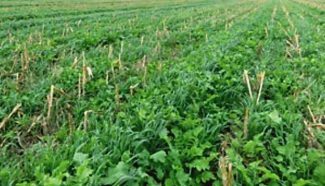 Later planting of cold-sensitive cover crops (after Sept. 10) typically does not provide enough time to accumulate sufficient biomass to support grazing animals prior to the onset of winter. Therefore, it is best to plant winter hardy species that can be grazed or harvested in the spring prior to planting of a summer crop (such as corn or soybeans). If early spring forage is desired, planting winter hardy species as late as Oct. 5 will still improve spring yields over spring planting. In terms of spring forage production, cereal rye matures earlier than triticale or wheat. If you plan to graze or harvest before mid-May, it is likely that cereal rye will have greater yields. If you plan to harvest after mid-May, triticale may produce greater yields. For cereal rye or triticale it is recommended that you plant between 80 to 100 pounds per acre. Planting winter hardy forage crops (such as cereal rye or winter varieties of other cereal grasses) in late summer or early fall can provide forage in the spring but their forage production in the fall is often less than cold-sensitive species. Thus if fall forage production is a major goal and planting can occur before Sept. 10 winter sensitive species will be more desirable.